Discovery, NASA’s oldest and most travelled space shuttle, has made a dramatic flypast over the centre of Washington D.C. on the way to its final resting place at the Smithsonian Air and Space Museum in Virginia. Discovery flew over the monuments along the National Mall in Washington DC at about 10:00 EST. 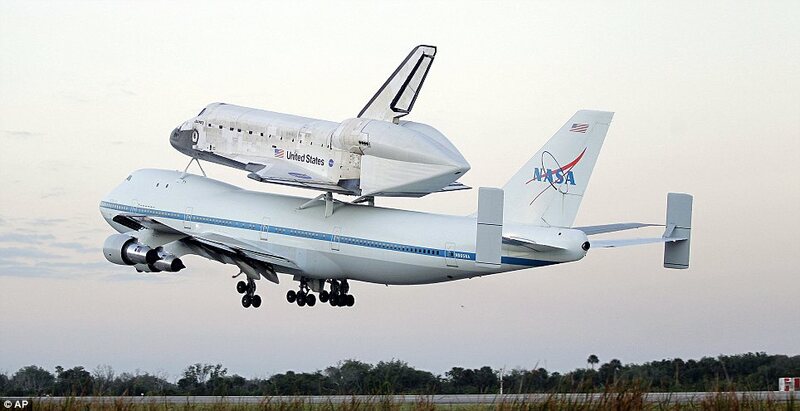 Piggy-backing on a modified Boeing 747, the retired space shuttle was flying at an altitude of about 1,500ft (457 m), NASA said. The shuttle programme ended in 2011. Discovery will be on show at the Air and Space Museum in Virginia. After circling four times over the Washington Monument, and passing the National Mall over Capitol Hill, the shuttle landed at Dulles Airport, a few miles outside Washington DC. From there it will be towed to the nearby Smithsonian Air and Space Museum, where it will be on permanent display. During the flypast, onlookers lined the roofs of the capital’s buildings and the route to the airport, wanting to catch a glimpse of the shuttle. Earlier, crowds of onlookers gathered along the Florida shoreline as dawn broke on Tuesday to see the shuttle take off from Kennedy Space Center. Cheers broke out from the estimated 2,000-strong crowd as the aircraft left the runway, the Associated Press reported. Dozens of former shuttle workers and NASA veterans were reported to be among the onlookers. Discovery then passed low over a packed beach and made one final turn back over the runway at the space complex before climbing towards a cruising altitude. The aircraft’s fuselage was illuminated by the early Florida sunshine for moments before it headed out of sight on its journey up the East Coast. In Washington, would-be shuttle-watchers gathered on the National Mall, the two-mile-long public park running through the heart of the city, for a prime view of the mid-morning flyover. Discovery descended to 1,500ft and was visible over the city’s Waterfront area, the Mall, and near the Jefferson Memorial. The flypast was also expected to delight onlookers at a regular plane-spotting haunt, Gravelly Point Park, just outside the city limits in Virginia. Discovery’s final destination is an annex of the Smithsonian Institute’s National Air and Space Museum, situated in Virginia, close to Dulles, the main international airport serving Washington DC. Discovery was the most-used of the shuttle fleet, flying 39 missions, and was designated the fleet leader. It is the first of three remaining shuttles to head to a museum. Enterprise – the prototype shuttle – and Endeavour will make their final journeys later this year. The shuttle fleet was decommissioned and the programme wound up in 2011, after 30 years in action, when construction was completed on the International Space Station. Retirement of NASA’s iconic shuttle fleet was ordered by the US government, in part due to the high cost of maintaining the ships. The decision leaves the country with no means of putting astronauts in orbit.